THE ACT OF MARCH 3, 1865 which authorized coinage of shield nickels and issue of certain classes of interest-bearing Treasury notes also ordered that henceforth all U.S. coins large enough to provide room for the motto IN GOD WE TRUST should bear those words. In practice, the $5, $10, $20 gold and all silver denominations above the dime were affected. Two sets of the gold denominations were coined dated 1865 with the new motto reverses; regular coinage followed dated 1866 after the Secretary of Treasury had approved the way the motto was squeezed into the limited space available. The average collector speaks of "Liberty Head half eagles" and both he and his hearers immediately realize that no type but the Coronet Head with Motto is meant; this is the familiar type, issued in enormous quantities (far larger overall than all previous types together). A common display item is a set of U.S. half eagles from all seven mints; the three southern coins will normally be Coronet Heads without motto, the other will normally be Coronet Heads with motto. So large were the mintages that even the New Orleans and Carson City coins will not provide major difficulty unless one wishes perfect Mint State examples. Philadelphia issues are rare prior to 1878 (except for 1873, which date was made in quantity from bullion obtained by remelting worn-out gold coins); some of these dates are more often seen in Proof State than in business strike form, notably 1869, 1872, 1875-6-7. Later years (except for the proof-only date 1887) constitute much of the bulk of what is generally called "common gold," less often collected than hoarded irrespective of date and mint mark. This hoarding practice delayed the discovery of the extremely rare plain overdate 1881/0 (parts of curves of 0 show on either side of final 1, most plainly at right). 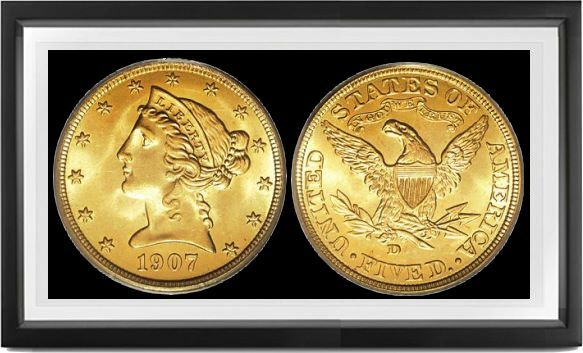 San Francisco issued far more gold than Philadelphia for much of the 1870's " 80's; the earlier years 1866-77 are all scarce, some being rare and all Mint State examples being very difficult to locate. After the official resumption of specie payments (1878), more bullion was brought to the mints for coinage, and enormous numbers of half eagles were paid out to redeem worn-out Legal Tender notes, National Bank notes, and the small remainder outstanding of the various classes of interest-bearing notes. But the coins mostly found their way into banks' cash reserves, quite a few going to French and Swiss banks in later years, from which they were recovered in the 1950s and 60s in quantity. The later eighties and nineties through 1907 from all mints, with an occasional exception like 1889, 1890, or 1892 O, can be readily obtained for a price in bag-marked Mint State; pristine examples free of bag marks are rare. Carson City issues are mostly much scarcer, the early years 1870-78 being rare. The reason for this was ultimately neither bullion shortages nor technical failure, but politics: there was perpetual agitation to close the Carson Mint, and in 1872-73 claims were made and verified that some lightweight and/or debased coins had been identified as from this branch (resulting in the firing of Superintendent H.F. Rice). Orders from Mint Director Lindeman limited the quantities of gold or silver to be issues from Carson City to only a small fraction of capacity, Nevada bullion being preferentially shipped to San Francisco, to the aggrandizement of Adams Express, Wells Fargo & Co., and other transportation agents with federal contracts, but regrettably also to the benefit of bandits and hostile Indians. With the excuse of limited output (! ), orders came from Washington in 1893 to close the Carson Mint for good. Limited issues from New Orleans 1892-94 (136,600 in all, or much less than 5% of the Philadelphia output in those years) is attributable to the economic condition of the postwar South " the mint had reopened in 1879 but only infinitesimal quantities of gold were coined of any denomination. The 1892 O has been in recent years recognized as a rarity. Proofs 1866-1907 (the unique 1908 reported has not been verified) are much rarer than their mintages suggest, many having been spent in depression years (1893, 1904, 1921, 1929-33) prior to the 1934 withdrawals.